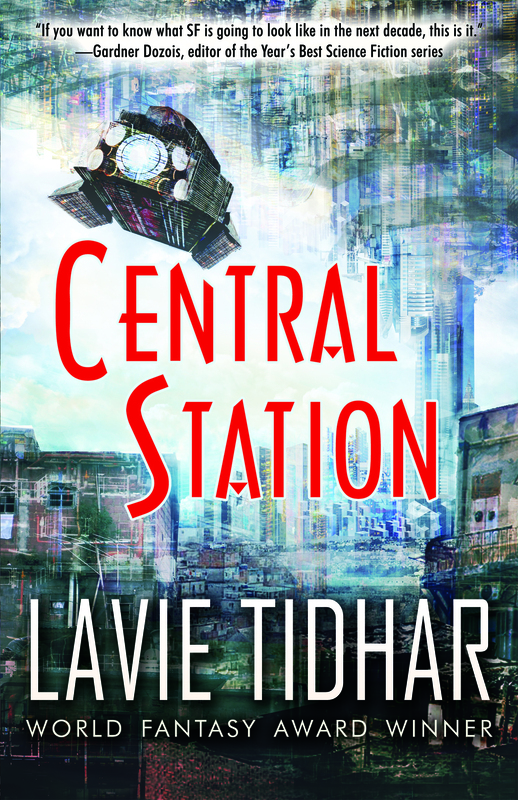 CENTRAL STATION – Lavie Tidhar (2016) | Weighing a pig doesn't fatten it. It strikes me as odd that people still are into this whole Literature vs. non-Literature distinction, especially people who review science fiction. Yet publishers like Tachyon make themselves complicit to this continuing confusion when they slap stuff like “magnificently blends literary and speculative elements … Readers of all persuasions will be entranced” on the back cover of their books. It’s understandable Tachyon does so: it adds cultural credits and a veneer of Serious Art to Lavie Tidhar’s newest book. They hope it will help sell more copies of Central Station, also outside the speculative crowd. I think they are mistaken. More on that later. First, a quick paragraph on my literary views. I don’t think a clear division between literature and non-literature can be upheld. What one can do is list criteria to judge how “good” a book is. People who have spent a couple of years at a university studying literature tend to like stuff like complexity, “depth” and originality. So yes, one could argue for a division between interesting books and superficial books. Whether a book is speculative or not isn’t a factor in that dichotomy. Of course, science fiction has a history in pulp magazines. True. But – newsflash: most books that people dub “literature” are bland and uninteresting too. Pulp is everywhere, not only in the speculative sphere. It’s Sturgeon’s law! So, back to Central Station. I doubt readers that consume only non-genre “literary” fiction will find much to love here. More on that later. Sure, some will love it because of the novelty value they’ll experience: for somebody who isn’t initiated in SF this book might seem original, ticking off one of those criteria I listed. On the other hand, people that read only SFF might be persuaded that they’ve read something “deep” as Publisher’s Weekly said this has true literary elements, and it feels a bit, yeah, hard to explain, it feels like literature, it’s vague and, well, hard to explain, it has this vibe. So, why did Publishers Weekly make its claim? I suspect a big part of it is the fact that Lavie Tidhar himself loudly claims to write “literary pulp” or “pulpy literature”. That sounds catchy, and it’s fun to quote, so it’s ideal for the lazy journalist who has to get his word count up. What it actually means is something else. I don’t think it means a lot. It’s just self-aggrandizing gibberish. The pulp part is easy, but I doubt Tidhar has a good definition of literature lined up to back up his claims, let alone a definition he could apply to Central Station. That leaves us with the final question: is Central Station a good book? I tend to read fiction for a couple of reasons: interesting world building (social, technological and scientific imagination), interesting characters (emotional imagination), interesting prose (artistic imagination) and an interesting story (dramatic imagination). Central Station‘s world building starts really well. There are plenty of interesting ideas, like forms of human-alien symbiosis and human-digital symbiosis. But it quickly becomes clear that none of these ideas are explored, let alone used to advance the story or character evolution. There just there as gimmicks, it seems. It’s of note that while the book is set in the far future (thousands of years ahead? ), it still has a fairly contemporary vibe. To me, Central Station‘s characters lack depth. Simple as that. They’re there for the same reason as the technology: a display of cool ideas. A data vampire, anyone? An oracle? A weather artist? A cyborg “robotnik”? A guy with “multigenerational mind-plague”? They drop in and out of the pages as easy as – insert whatever. The prose does the job, but nothing more. Unremarkable. Okay. The story? It is best to approach this as a collection of vignettes. That’s not necessarily a bad thing, as there’s collections I like a lot. But this collection? The book has 271 pages. I was enthralled until page 65, 70. By page 150 I was bored, and I had to struggle to continue to the end. Like the characters, it lacks depth. One more thing. People might be tricked into thinking the book has interesting political stuff to say since the setting is future Tel Aviv. It is not the case. Granted, there are new immigrants all over, and veterans from old wars. But that aside, Tel Aviv as a setting is as superficial as the rest of the novel: just a backdrop, not a fictional commentary on one of the most pressing real world contemporary crises. A shame, as Lavie Tidhar was born and raised in Israel. One would think he could offer more than pulp on the issue. Then again, opinions tend to differ. Publishers Weekly found “characters wrestle with problems of identity forged under systems of oppression, much as displaced Easterners and Westerners do in the novels of Orhan Pamuk.” I guess it’s all in the eye of the beholder: maybe you’ll find them too, after you’ve read those Orhan Pamuk novels. They won him the Nobel Prize. Will Tidhar someday? I guess after Dylan all bets are off. This entry was posted in Reviews and tagged 2010s, Campbell Winner, Central Station, Lavie Tidhar, Review, Science Fiction. Bookmark the permalink. I agree with what you say about the whole literary vs genre brouhaha: what matters is whether a piece is good, that is, whether it succeeds on its own terms. It’s like being sniffy about one composer’s popular song as against a symphony, say, or a Missa Solemnis. Yes indeed, it’s just another form of elitism. Have not read this book, but as usual, your review has a lot of interesting things to say. I do feel that it’s harder to maintain an overall vision of decent, far-flung SF through a series of vignettes rather than a consistent core story. Sure, you can dip in and out of the various aspects of the society you’re creating, but that’s equally possible in a “full-length” story, and arguably there’s the advantage of some central theme or intent to tie everything back to: sure, we’re seeing all this wreird future tech, but they’re in this place because they’re trying to find a thing because of the events in the first third…hopefully you get my point. Something of that gets lost in a vignette’d appraoch, possibly due to a lack of central anchor to ground or provide thenecessary context or closure that great SF is built on. Perhaps that’s where the “literary” comparisons come from: the lack of overall closure, the perceived lack of completeness in the narrative becaue each part is simply examined briefly and then thrown aside for the nect shiny object on the conveyor. Literay fiction loves an incomplete conceit, where genre nerds such as myself are quite fodn of things being introduced for some larger purpose, reason, function, or illustration. But I am just spitballing here since I’ve not read this and — thanks to your reivew — I don’t feel a need to picke it up, so I guess I’ll never know…! I couldn’t have said that better. Tidhar’s kaleidoscopic approach pays tribute to lots of other SF authors, but imo ultimately doesn’t have enough meat on its own bones. This is not so much because of the vignette approach, but simply because of the lack of real depth – as opposed to suggested depth, of which there is plenty. That idea of suggested vs. real depth is an intriguing one, hey? See, I immediately think of Bester’s The Stars My Destination, which similarly a series of vignettes — and ones that change suddenly in tone at the halfway point, no less — but there’s so much behind what he writes, even in his incredibly unadorned prose, that I certainly found a huge amount of both brevity and complexity in what he was saying. There’s obviously a huge amount of individual perception playing a role here, too, but it goes to show that it is possible to skim over the surface of something and still give a sense of what lies beneath that is satisfying. That Bester is my TBR. What you write makes me even more curious about it. Nice post. I also often wonder about the division of scifi from other books. The more posts and reviews I write about it, the deeper that inner conversation pulls me. Every time I hear some disparaging comment about speculative fiction – and mostly I hear them from people who never read any and have only some preconceived ideas about it – I feel annoyed. But when a spec-fic writer feels the need to mask his work with a covering of “literary endeavor”, as if they were ashamed of the genre they work in, I get angry. Because as long as the wider public’s mental image of the genre does not change, the division between literary and non-literary will keep to exist, pasting an undeserved label, not unlike that of B-movies, on speculative fiction. It would seem that this particular author’s attempt at masking his choice of genre did not work well: maybe a more honest approach would not have clipped his proverbial wings…. Good thoughts on literature vs. non-lit. I’ve tended to stray away from those arguments because I read for fun. It might be some deep work of “literature” or something quite pulpy, but whatever it may be, rest assured I’m finding something about it engaging and entertaining. I came close to picking up a copy of this at World Con this past summer. I like the “idea” of it. As a fan of short stories I tend to like “vignette” novels/collections, but there was something about what I was reading from reviewers that made me give it a pass, and I remember a lot of that agreeing with your sentiments here. It is really too bad it wasn’t better executed to hold your interest.